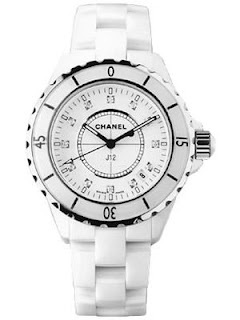 When Chanel came out with their J12 ceramic watches in black and white a few years ago, I fell hard. Of course the several-thousand-dollar price tag and diamond-embedded face placed this way beyond my budget. And let's face it, my lifestyle (as I sit here in my Syracuse sweatpants with a puppy on my lap). Enter cheaper alternative. 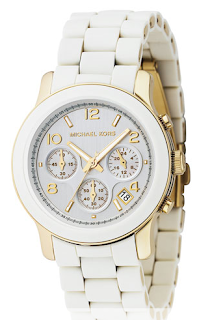 Thank you, Michael Kors, for this glam and seriously affordable option. I love the style of the easy-to-read numbers and the gold accents. This beauty will be my next big purchase. Definitely. 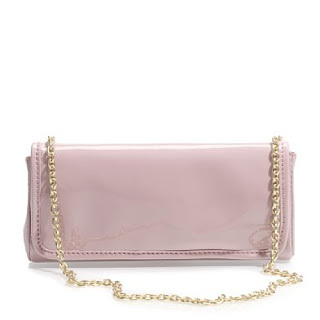 Also, thanks to the always-on-top-of-it Danielle, author of Off the Hanger fashion blog, for pointing out this darling clutch that just went on sale at J.Crew. 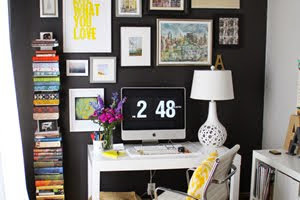 AND you get an extra 30% off with the code EXTRA30 if you purchase before March 12. It will probably be sold out by then, though, so hurry! UPDATE: This item is sold out. Darn. I just checked the J.Crew web site this morning and the purse is NOT THERE ANYMORE. Yikes :( Let's hope for a reappearance! Love the watches by the way! Oh Chanel, why are you so expensive? I love this watch!!! Thanks for the Post!! Great find! I love the black Chanel watch, too. I need to get my watch fitted for my wrist but I do love it. And which puppy was on your lap?! My friend has the Michael Kors watch - she's a Chanel freak so I'm sure that's why she went for it. It looks great on her too! I'm sure it will look fabulous on you whether you're wearing sweatpants covered in puppy or a super hot LBD! I have also been in love with that Chanel watch for sometime!! 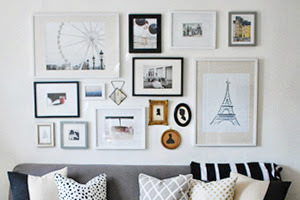 Fossil has some new options that are great too as an alternative!